When St. Thomas Aquinas turns to his study of the moral life, the return of the rational creature to his Creator, he begins not with the personal conscience of the believer, nor with the objective precepts of the moral law, nor even with virtue and vice, but with the pursuit of happiness. In the Summa Theologica, St. Thomas tells us that happiness is the last end of all men, it is the one end two which all men tend. This, then, is the goal of morality: To aid us in the attainment of happiness, which is found in the vision of the Divine Essence. Christ our Savior does not begin his instruction with law, nor with the subjective discernment of the individual conscience, but with beatitude. Blessed, he says, which means happy. He draws the disciples to the Christian life through appealing to their deepest desire – he who made us knows that we want to be happy, and he also knows how we will get there. There are only three hearts, as far as I know, which are regularly depicted in the Catholic artistic tradition – the Most Sacred Heart of Jesus, the Immaculate Heart of Mary, and the heart of St. Thomas Aquinas. Now let me be clear, I am not claiming that the sunburst so often depicted on St. Thomas’ breast is literally his heart – neither, of course, are the images of Christ’s or Mary’s Hearts depictions of physical organs – but it is quite striking that the sunburst is over the Common Doctor’s heart (and not, for example, upon his brow). I do not in any sense intend to equate St. Thomas’ sunburst with the Hearts of Jesus and Mary, but it will be good for us to consider the simple fact: No other saint’s heart is regularly depicted in Christian art. There are, certainly, many saints whose hearts might have been given this focus – consider St. Philip Neri, whose heart was physically enlarged with Love; or St. Charles Borromeo, whose heart is preserved incorrupt; or perhaps even St. Edmund Campion, whose heart was torn from his body. However, there is no other saint whom the Christian artistic tradition regularly depicts with a special focus on their heart. 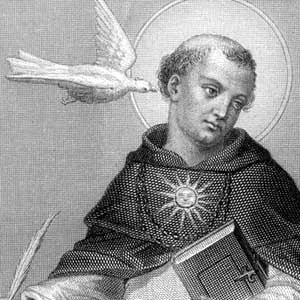 What is it about St. Thomas Aquinas that gained him the image of the sunburst, and why is it placed over his heart? 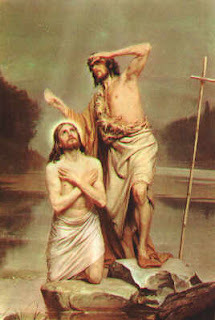 John the Baptist testifies that he did not know Jesus until after the baptism, when he saw the Holy Spirit come down and remain upon the Lord. But what can the Baptist possibly mean? What did he not know about Jesus? Recall, of course, that John was the second cousin of the Lord – for his mother Elizabeth was the cousin of the Blessed Virgin Mary. Could it be that the child of the visitation, who leapt in the womb in the presence of the unborn Lord, did not recognize the Messiah when he came to him as a man? In what may be the greatest scriptural commentary of the early Church, the Tractates on John, St. Augustine discusses this very point. We will rely on him as a sure witness to the Tradition, and a guide in speculative theology. “One of the weaknesses of the postconciliar liturgical reform can doubtless be traced to the armchair strategy of academics, drawing up things on paper which, in fact, would presuppose years of organic growth. The most blatant example of this is the reform of the Calendar: those responsible simply did not realize how much the various annual feasts had influenced Christian people's relation to time […] they ignored a fundamental law of religious life.” Joseph Cardinal Ratzinger, The Feast of Faith, 81-82 (published by Ignatius Press). The Reformed Novus Ordo Calendar is extremely cautious about respecting the principle of the consecration of time – for this reason, there has been great emphasis on celebrating the Liturgy of the Hours at the “canonical hours,” i.e. praying Morning Prayer in the morning and Evening Prayer in the evening. It was this zeal to sanctify the day which lead the Church to explicitly forbid the ancient practice of celebrating Morning Prayer immediately after the Christmas midnight Mass (though it is perfectly acceptable to pray Night Prayer after midnight on any day of the year). Indeed, this great concern of the now-a-days Church is particularly manifest at Christmas. For example, while Canon Law allows a priest to celebrate three Masses on Christmas day (CIC 951.1), the General Instruction of the Roman Missal clarifies that this permission is given “provided that the Masses are celebrated at their proper times of day” (GIRM 204) – three Masses on Christmas, but they must be at midnight, at dawn, and during the day (we are left to wonder what happens if the papal midnight Mass begins at 10pm). However, with all this focus on the sanctification of time, the reformed plan of the Novus Ordo calendar simply butchers the season of Christmas – and follows this by the destruction of Epiphanytide. Below is the text of a homily given by a priest friend of mine last Sunday. Today is the feast of the Epiphany of the Lord; yes, I say it is the feast of the Lord’s Epiphany! 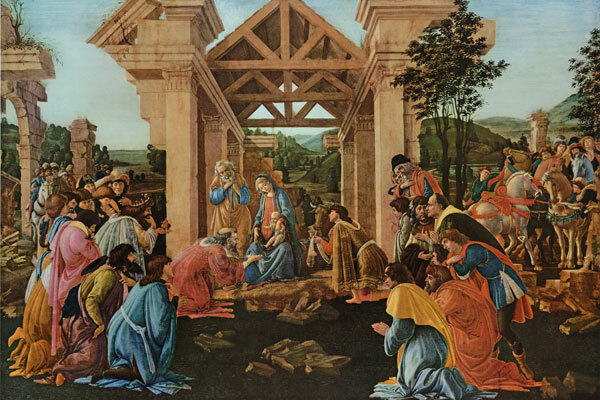 For indeed, the Epiphany is not only the commemoration of the adoration of the Magi, but it includes also two other mysteries: Our Lord’s baptism in the Jordan and the wedding feast at Cana. And so, today’s feast of Christ’s baptism is a second Epiphany – for this reason, from ancient times, the Baptism of the Lord has been celebrated on the octave of the Epiphany. The very word Epiphany means “manifestation”; Epiphany is the manifestation of Christ to the world. In Bethlehem, shortly after our Lord’s birth, there was the first Epiphany, a hidden Epiphany – for none but the Magi (and the shepherds before them) recognized the Child as the Christ and true Lord of all. This first manifestation was part of the hidden life of Christ, hence it is a private Epiphany. Today, however, we have the second Epiphany which is a public Epiphany – for it is with his baptism that the Lord begins his public ministry. Now, at the age of thirty, our Savior manifests himself publicly and before all. And what is the Epiphany which we celebrate at the Lord’s baptism? What about Christ was made manifest to the world today? Behold, the heavens were opened and the Spirit descended and the voice of the Father was heard – This is my beloved Son, in whom I am well pleased. This is the Epiphany, the manifestation of Christ: He is revealed to all as the true Son of God, and God himself! Though St. Raymond of Pennafort died on January 6th, his feast is celebrated today (though, in years past it was kept on January 23rd) – the reason for this move, of course, is that January 6th is the feast of the Epiphany, at least in any country where the Bishops recall what the twelve days of Christmas are all about. As I look in my old Roman Martyrology, I see that St. Lucian, a priest of the Church of Antioch, died today in Nicomedia, having suffered under Maximian Galerius. This is the same Lucian whom St. John Chrysostom praised. Moreover, at Antioch, the deacon St. Clerus who was tortured seven times and suffered long in prison, was beheaded on this day and so consummated his martyrdom. Of course, we recall the martyrs Felix and Januarius, who gave up the ghost in Heraclea. This is the celestial birthday of both St. Julian, martyr and also, in Denmark, St. Canute who was both a king and martyr. Then there are the bishops Crispin, who died in Pavia, and, in Dacia, Nicetas – both holy confessors. Also, there is the holy monk Theodore, who, in Egypt, flourished in holiness in the time of Constantine the Great, and of whom St. Athanasius makes mention in his life of St. Antony. And elsewhere many other holy martyrs, confessors and holy virgins. Because I have read my Martyrology, I am able to pray to all these holy saints of God today. What is more, I am inspired by the examples of these martyrs and confessors – they help me to recognize that I have only just begun to give myself over to the Lord. Additionally, I have found the topic of my morning meditation – today, Mother Church commemorates the bringing back of the Child Jesus from Egypt. It may seem to us anachronistic to say that the Magi certainly believed in the divinity of Christ. How could this be? Was not Christ's divinity only clearly defined by the First Council of Nicea in 325 A.D.? Was there no gradual discovery of the Lord's two natures throughout the Church's experience of reflecting on the Preaching of the Apostles? Such thinking may be common and it may be understandable (from a natural point of view), but it is not Christian. The Fathers of the Church are clear that the Scriptural and Traditional witness to the Adoration of the Magi indicates that these wise men, through the inspiration of the Holy Spirit, as Thomas Aquinas says, knew that the Child they were adoring was no ordinary human king. As Chrysostom says (Hom. ii in Matth. [From the supposititious Opus Imperfectum): "If the Magi had come in search of an earthly King, they would have been disconcerted at finding that they had taken the trouble to come such a long way for nothing. Consequently they would have neither adored nor offered gifts. But since they sought a heavenly King, though they found in Him no signs of royal pre-eminence, yet, content with the testimony of the star alone, they adored: for they saw a man, and they acknowledged a God." 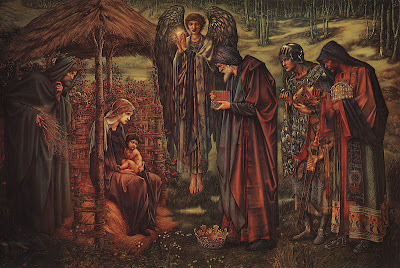 Moreover, they offer gifts in keeping with Christ's greatness: "gold, as to the great King; they offer up incense as to God, because it is used in the Divine Sacrifice; and myrrh, which is used in embalming the bodies of the dead, is offered as to Him who is to die for the salvation of all" (Gregory, Hom. x in Evang.). And hereby, as Gregory says (Hom. x in Evang. ), we are taught to offer gold, "which signifies wisdom, to the new-born King, by the luster of our wisdom in His sight." We offer God incense, "which signifies fervor in prayer, if our constant prayers mount up to God with an odor of sweetness"; and we offer myrrh, "which signifies mortification of the flesh, if we mortify the ill-deeds of the flesh by refraining from them." 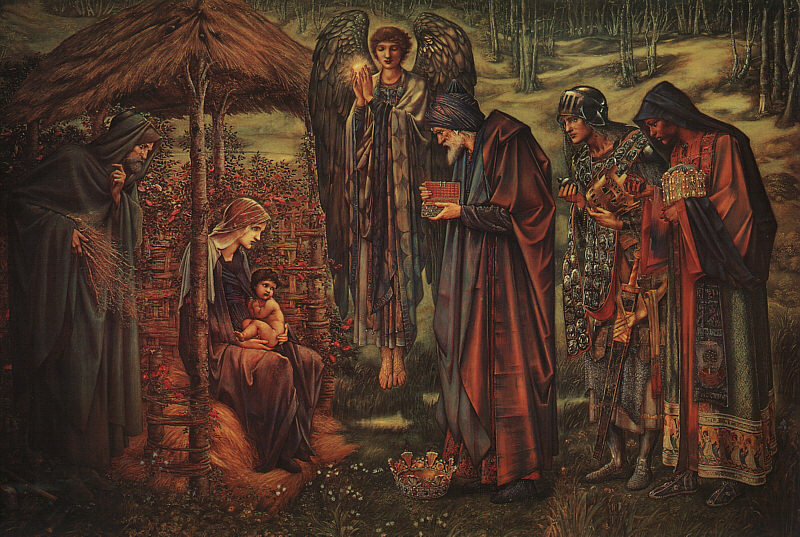 On this Solemnity of the Epiphany (which my particular church celebrates today), let us imitate these Wise Men, the first Gentiles to believe in Christ, and offer from our hearts the gifts of golden wisdom of mind for our King, sweet frankincense of prayer to our God, and the loving myrrh of mortification to our High Priest, Who is not unable to sympathize with our weakness.